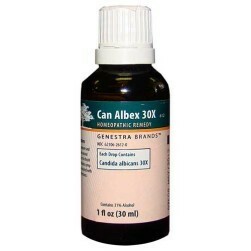 Can Albex 30X is a homeopathic nosode preparation and is part of the unique Can Albex Candidiasis Program, specifically formulated to stimulate the body's natural defenses and for preventing infections from occuring. Candida albicans releases toxins which spread throughout the body, resulting in systemic immune system overload and dysfunction. Can Albex 30X is indicated for candidiasis, thrush, and fungal infections, food and chemical sensitivities, chronic headaches, fatigue, digestive disturbances and vaginal yeast infections.